"Each character in this startlingly mature debut novel, from Becca’s self-absorbed father and self-destructive mother to Buckley’s evangelical stepdad, is complicated, nuanced, and sympathetic. Young-Stone’s writing style is crystal clear and shot through with lightning-like flashes of description so vivid that readers might think that they are watching a movie. VERDICT: It’s not often that this reviewer regrets a book ending, but that’s what happened here. The sense of melancholy, tempered by the resilience and heart of the characters, makes this ripe for Oprah or fans of Elizabeth Berg or Anne Tyler." "Luminescent . . . Becca and Buckley’s parallel stories, as well as curiosity about how their paths finally converge, will keep the pages turning, while the complex, colorful characters, and the deep bonds that form between them in spite of and even because of the tragedies they survive, will live on in readers’ minds long after they reach the end of this powerful, beautiful novel." "Vibrant, funny, complicated, magical, heartbreaking, electric. 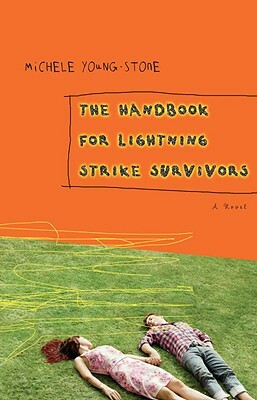 Michele Young-Stone’s debut novel The Handbook for Lightning Strike Survivors is all of this and more. I loved it! I’ve been waiting to read a book like this for years." "If you have anything else to do in your life, don’t open the cover of Michele Young-Stone’s The Handbook for Lightning Strike Survivors. You won’t be thinking about anything except Becca Burke’s amazing life for a very long time . . . "